Thanks for all the well wishes for me to recover from this stupid cold - this mega jerk seems to want to linger around, and give me a hideous red nose, which could light the way far better than Rudolph's shiny snozz. When I haven't absolutely had to do work, I have been hiding under a duvet being totally pathetic - seriously don't feel sorry for me, I am the worst patient ever. A whiney, snotty, moany mess - isn't my boyfriend lucky, I really did look like the swamp thing yesterday, I don't know how he managed to kiss me, maybe he scrubbed his face with sandpaper afterwards, whilst weeping at the awfulness of it all. 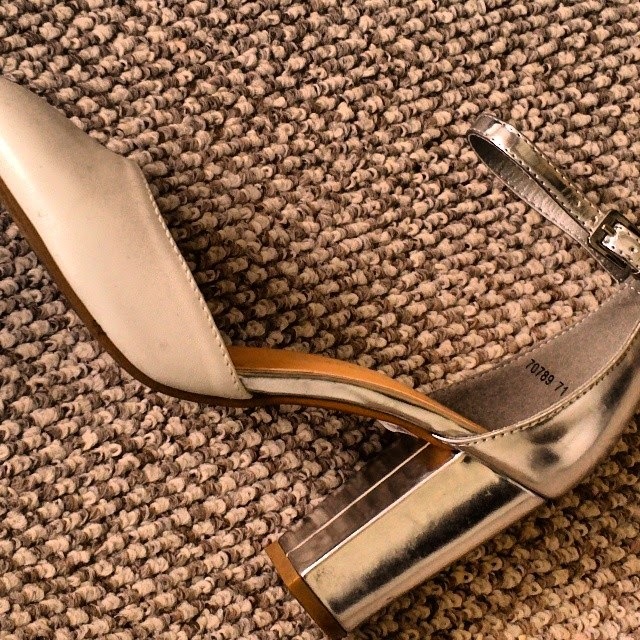 Silver and White Block Heels, Primark - In Stores Now. Being under the weather is always my worst time for anxiety, so I did have a little bit of a wobble the other day. But, as I tell other people you have to look at each new day as a totally new chapter, only you can write it, so start with a positive begining and who knows what will happen. I'm happy to report, I put that little panic attack behind me and I'm moving on. Anyway, onto the fashion part - this playsuit from New Look, is a fairly new wardrobe addition and was worn to the opening of a new bar, which was designed by my boyfriend's best friend and business partner, so we were lucky enough to jump the queue. I have been obsessed with jumpsuits and playsuits recently and have added a number to my collection since this one. I feel so fabulous, until I have to go to the loo and you realise you have to be a bit of a contortionist to get the zip down, then again when it needs to go back up. The print of this playsuit is gorgeous, with pops of neon against China blues, and the skort detail is so cute, whilst protecting my modesty. I had to team it with my new £12 bargain shoes from Primark and my mint green kimono from H&M, just to keep the chills away on the walk home. Finish off with my favourite necklace adn some neon pink stick on nails from Primark, which are amazing by the way, and I was good to go. So, how do you guys feel about jumpsuits and playsuits? Do you love them like I do, or does having to completely undress when you go to the toilet put you off? It's for sure annoying having to totally undress to go to the bathroom! But for fashion I will do it! Haha :) I totally love playsuits! :D They're sooo cute and definitely my style! The shoes you have here are amazing! Hope you had fun at the bar opening! Sounds exciting. I hope you are doing ok. I appreciate your honesty about anxiety and also your positive attitude. I am so in love with your shoes, I seriously need them in my life. Loving the thicker heel at the moment. If I say those shoes in the shops, I'd buy them in a heartbeat. I love playsuits, the going to the loo thing is such a pain though! I have a really nice spotted H by Henry Holland playsuit but when I go to the loo in public area, I basically have to do some crazy cubicle yoga! Haha. 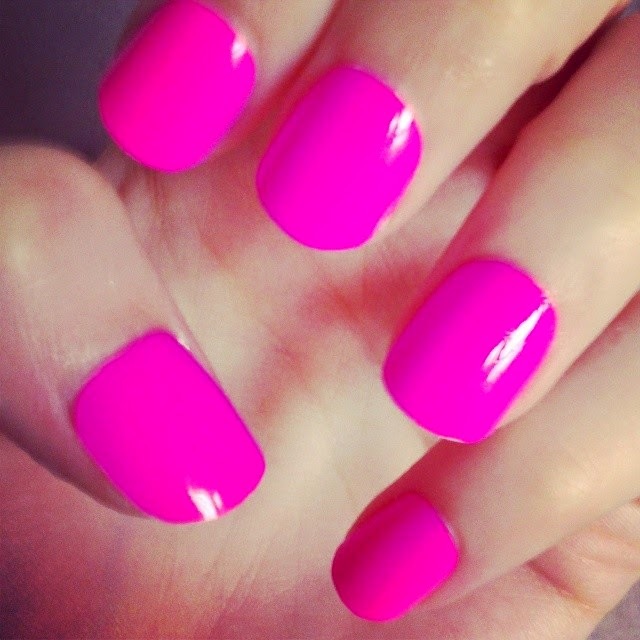 You look great in that playsuit, and loving the neon nails! Also glad to hear you're coping well with your anxiety, I suffer from severe anxiety problems myself so can sympathise that its something huge to handle! I wore a play suit to the pub on Saturday. I found that it was easier the more I had to drink. This piece is a fabulous find! I love the skort element and the colours; china blues? PLEASE! And how divine are the shoes? I can't believe they are from Primark! They are truly beautiful! Sassy and stylish for the opening of a new bar, sounds fab and even better you got to jump the queue ;) I adore the pop of pink your nails bring, you have such a knack for painting them so prettily. I always enjoy hearing you talk about your clothes, outfits and everything else, you have such a natural talent as a writer, and your warmth and humour shines through each post every time.